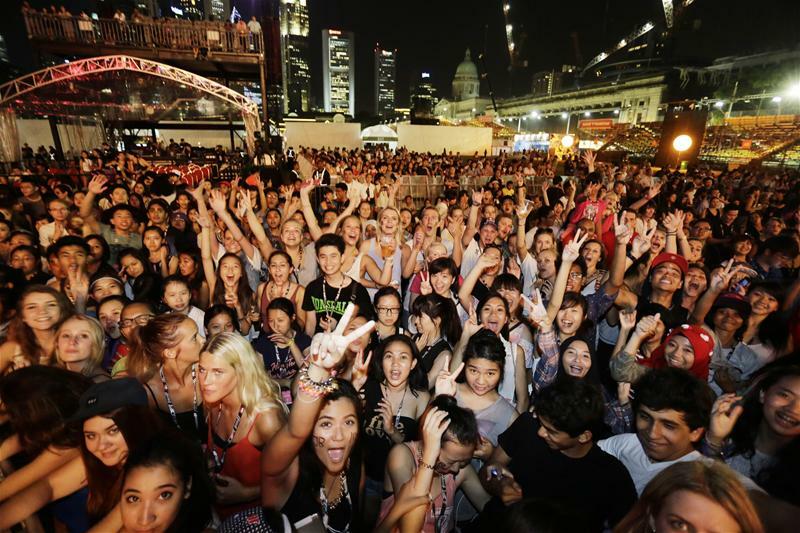 Arguably one of the biggest stars on the planet, Canadian pop sensation Justin Bieber graced the Padang stage for the closing concert of Singapore’s annual F1 Grand Prix. Teenage girls showed up in their thousands from 5am onwards, queuing in a messy open space which was clearly not prepared for the pandemonium that ensued. In theory, the staging and queuing systems would have worked perfectly fine – but the concert organisers clearly didn’t expect the amount of dedication that Singapore Beliebers brought to the event. The queuing system was extremely worrying, with water not being readily available and bathroom access not available for a portion of the day. Once inside the venue things got slightly better, but those at the barricades suffered immensely with all of the intense pushing. Security guards tried their best to get the unruly crowd to sit down, but unfortunately the fans weren’t having any of it. Fortunately they were consistently handing out water and tried their best to pull out the many ill girls that suffered from dehydration and over-excitement. The concert itself was extremely impressive. Coming from neither a fan nor a hater, the concert was truly very good. Bieber was politely on time at roughly 8:15pm and wrapped up his set before 11pm. A far cry from his 3 hour delayed start in London. His punctuality paired with his energetic entrance (plus all the screams echoing around the enclosed space) made for quite the spectacular entrance. His show was a lot more thought out and put together than Rihanna’s was, the stage was bigger and more versatile- and he made better use of the space. Every fan no matter where they stood got a great view of Bieber thanks to his generously choreographed dance routines that made their way around the set. Songs from his latest album (especially the down tempo songs) got lost in the excitement, but heavy hitting upbeat songs like “Never Say Never” and “Beauty and a Beat” really got the crowd going. Justin’s band was comprised of extremely skilled musicians, that added to his musicality greatly. The show was smooth and cohesive thanks to the background musicians and dancers who worked just as hard as Bieber did. With fast paced dance routines and songs that are slightly out of his range, at times lip syncing was employed. It was pretty obvious when he stopped singing as the energy went straight out of his face, and an auto tuned squeaky voice boomed out much louder than his natural one over the speakers. Disregarding the crazy fans, the experience was pretty great! The young star has amazing stage presence and is a seasoned pro when it comes to his stage performance. It’s often hard to believe that he’s only 19.